wWhich Oral-B brush should you choose when you Go Pro? 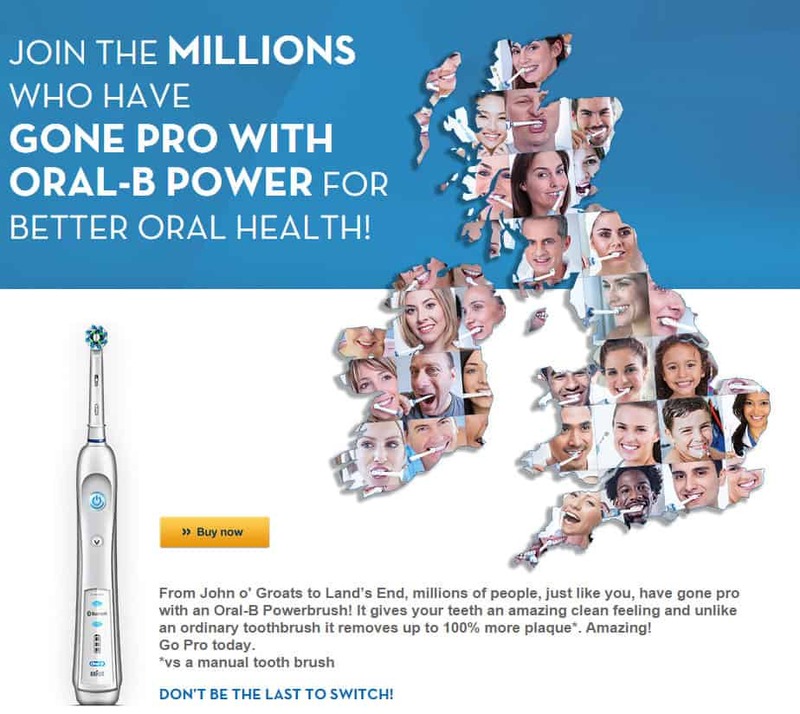 If you are in the UK you may have seen on the TV or online adverts from Oral-B talking about millions who have ‘gone pro with oral-b power’. The adverts explain how by using an Oral-B power toothbrush you can have cleaner and healthier teeth, but there is little more information than that. 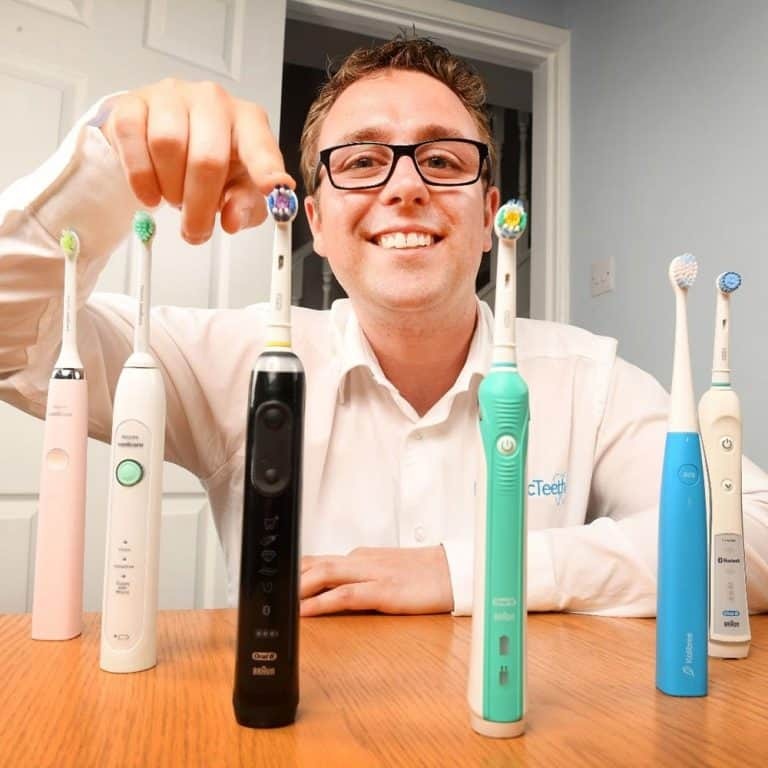 Here at Electric Teeth we have used and tested many electric toothbrushes and Oral B models are ones that are often seen and demanded by users due to the awareness of the brand. In fact the Oral-B brushes make up the majority of our electric toothbrush reviews. We want to shed a little more light and explanation on the range that the 30 second TV advert does not. If you’re looking for somewhere to buy an Oral B Go Pro toothbrush, we recommend checking out Amazon as they usually have pretty good discounts. What does going Pro actually mean? Well there are 2 parts to this answer. The first of which is ditching the manual toothbrush for a powerbrush or electric toothbrush, whatever name you prefer. The second is in relation to a range of electric toothbrushes that Oral-B offer. This is the Pro series which consists of 16 brushes as per their site at the time of writing. Therefore ‘going pro’ suddenly becomes a little more complicated. However, if you bear with us and continue reading we will make things simpler (or at least that is the aim). Laboratory tests confirm that electric toothbrushes can remove up to 100% more plaque than a manual toothbrush. Helped by the power and consistent brush stroke the head of the brush sweeps along the gumline, across the teeth and in between to sweep away harmful plaque. An electric toothbrush will provide a consistent level of power compared to a manual brush operated by a human. An electric toothbrush will continue to provide the same brush stroke time after time after time whereas a manually operated brush cannot offer this. When brushing twice a day with an electric toothbrush you can be assured of a better clean which in turn can reduce staining to teeth and offer a whiter smile. The consistent clean and better removal of plaque reduces the amount of possible harmful bacteria in the body and helps keep you healthy. Using an electric toothbrush allows you to benefit from different cleaning modes, different brush heads and even the ability to share with other family members, you do not all need a different brush, just different brush heads. Switching to an electric toothbrush will provide some benefits irrespective of your brushing style but making sure you have the right technique is just as important and will have just as much effect on the effectiveness of the clean. We have a detailed guide here on the correct technique. There is no getting away from the fact that even the cheapest electric toothbrush is about 5-10 times the price of a manual toothbrush. There is then the ongoing cost of replacing heads and the power needed. However, can you put a price on cleaner, whiter teeth and a healthier smile? A pro series brush can cost as little as 5p per day. There is a massive selection but it is not as confusing as it first appears. We make it easy for you to understand the difference below. Oral-B offer 2 different series of electric toothbrushes. There is the Pro and TriZone series. The difference is the brush head. The Pro series has an oscillating rotating and pulsating movement compared to the sweeping motion of the TriZone. In the animations below you can see the different motions of the brush heads. There are 6 different interchangeable heads for the Pro series of which one is a TriZone brush head. This is because a TriZone brush head works on a Pro series brush handle and a Pro series brush head works on a TriZone series brush handle. Ultimately the TriZone and Pro series brush handles are the same in size, weight and battery performance, the difference is the colour and the cleaning modes. There is no TriZone 6000 or 6500 whereas there is Pro 6000 and 6500. These models are the superior flagship products and are essentially like the supercars of the toothbrush world in some respects. The Pro series is the most popular as most studies (and a little bit of clever marketing) has made the Pro series the most in demand. Ultimately either the Pro or TriZone will offer a better clean with more plaque removal when compared to a manual brush. You can read more about the differences and watch a video in our Pro vs TriZone post. Any powerbrush from Oral-B’s Pro series offers you the ability to change which brush head comes supplied. Different models will come with different brush heads included. Some have one, some have multiple heads. Cross Action – Perfectly angled bristles are designed to lift and remove up to 100% more plaque along the gumline. Floss Action – Features Micropulse bristles that penetrate deep between teeth to sweep away plaque. Precision Clean – Removes more plaque than a regular manual toothbrush and promotes clean mouth and healthy gums. Sensitive – Provides a gentle brushing experience that is ideal for sensitive teeth and gums. Ortho – Specially designed to clean around orthodontic work. Ideal for the cleaning and care of dental braces. You could use one or a multiple to work in line with the different cleaning modes. What you chose will be based on your preferences. Which brush is shown in the advert? The brush shown in the advert is the Oral-B Pro 6000. This is a premium ‘Smart Series’ brush which offers 5 cleaning modes, 10 days of battery life, a travel case, wireless smart guide, brush head storage and Bluetooth connectivity to work with an app. You can find out more about the Pro 6000 here in our full hands on review. Which Pro brush should I choose? Which brush you chose will be affected by your needs, desires and the price you can afford to pay. Always select the brush best suited to your needs. For a large percentage of the population, a brush like the Pro 600 is perfectly adequate. It offers one cleaning mode, 7 days of battery life and is relatively cheap. A brush like the Pro 5000 offers a lot more box contents and features but will be more expensive. If you have sensitive gums or advanced oral healthcare needs it is probably worth selecting a brush with more feature such as a sensitive mode. What is the difference between the Oral-B Pro brushes? The differences between the brushes are not as complicated as it may seem and is ultimately the cleaning modes offered and the box contents. The more you get the higher the price. 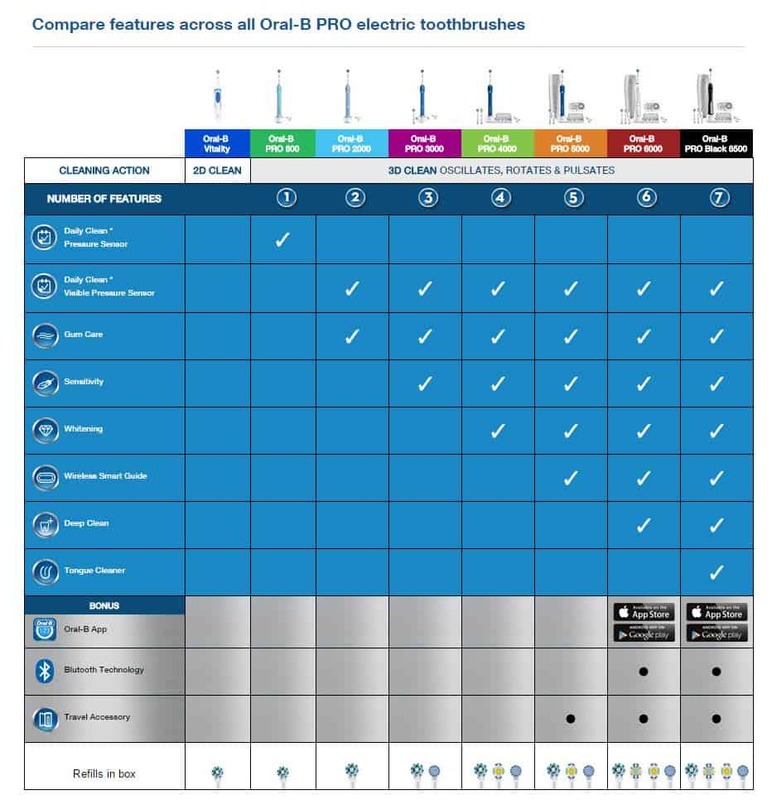 The following is a comparison chart from Oral-B themselves which includes the main brushes they offer. In between this range are a few additional models, most notably the Pro 650, Pro 2500 and Pro 4500 which are technically the same as the Pro 600, 2000 and 4000 but have a black rubber grip on the front and often offer something extra in the box. Refer to our hands on for each brush to clarify. Not mentioned on the chart is the battery life. All models offer 28 minutes of usage time from the battery or 7 days/14 cleans based on two, two minute cleans each day by one user. The Pro 6000 and 6500 offer up to 10 days or 40 minutes of cleaning time. For more comprehensive comparisons between the brushes, head to our comparison page here which has written comparisons or check out our YouTube Channel page here which has an increasing number of hands on comparisons. Which is the cheapest Pro brush? The cheapest Pro brush is the Pro 600. This is a no nonsense simple electric toothbrush with 1 cleaning mode and 7 day battery life. Simple, effective and cheap we gave it a 5/5 rating in our review here. It can cost as little as 5p per day to run. What is the most expensive Pro brush? The most expensive brush is the Pro 6500 Black. This has all the bells and whistles you could want of an electric toothbrush. It is virtually identical to the Pro 6000 but the difference is the colour and a tongue cleaning mode. If you are not familiar with the electric toothbrush market, the products tend to have a recommended retail price which is well above what they are really worth and what in reality the average price of them is. Some retailers will sell at the full price and from time to time offer lower prices through promotions. Generally speaking, depending on the time of year and the brush in question you should be able to get anywhere from 20-50% off the RRP. The largest discounts are usually on the the more expensive brushes. However, the important thing to do is shop around. We typically recommend Amazon as they are always very competitive on price and offer swift delivery as well as carrying the majority of the Oral-B range. You can buy from Amazon here. Other great outlets, typically selling lower than RRP include Superdrug and Boots, however you may find other outlets on your high street or online that are just as competitive. What is in the box with the Pro brushes? The box contents of each brush will vary and is ultimately affected by price. The more you pay, the more you get. We have had hands on with many of the electric toothbrushes from Oral-B and you can see below one of our unboxing videos, for the Pro 3000, below. You can see more unboxing videos on our YouTube channel, plus a list of the items that come with each toothbrush. What is daily clean mode? This is the comprehensive everyday cleaning mode that works with the provided CrossAction brush head to effectively clean the teeth using the Oral-B 3D oscillating, rotating and pulsating technology to clean the teeth and remove up to 100% more plaque than a manual brush. What is gum care mode? Using a lower speed and power output through the brush head in conjunction with the provided Cross Action to clean the teeth and massage gums, stimulating blood flow and assisting in reducing sensitivity in the gums when brushing. A gentle yet thorough cleaning mode that combined with the sensitive brush head works to remove bacteria and plaque from sensitive areas of the mouth. The brush head that is supplied with each Pro series brush differs, although Corss Action is the most popular. You can change the head with any others on offer from Oral-B. There are many that work with the brush handle. There are 6 main brush head options that include Cross Action, Floss Action, 3D White, Sensitive, Precision Clean and TriZone. Is there a pressure sensor? All models with the exception of the Pro 600, 650 and 670 have a pressure sensor. Only the Pro 6000 and 6500 offer Bluetooth. All offer sound connectivity although Bluetooth is the better and more reliable option. If purchased new from an approved retailer any Pro series will come with a 2 year warranty which can be extended by a further year to 3 in total if you register the brush online on Oral-B’s website. Does the Pro series have a built in timer? Yes. Often referred to as the quadpacer; subject to the cleaning mode the brush will provide an audible warning through a slight pause in the brushing mode to tell you to change quadrants. There are 4 quadrants to the mouth, and brushing is normally for 2 minutes. The timer will active at 30 second intervals, with a different sound at the end of the 2 minutes. The 5000, 6000 and 6500 offer a visual timer in the form of the Smart Wireless Guide. The 6000 and 6500 pressure sensor will also illuminate green when the quadpacer is activated. The battery lasts up to 28 minutes, which if used on the standard daily clean mode is 7 days based on 2 cleans per day on all brushes with the exception of the Pro 6000 and 6500 which offer up to 40 minutes of usage. Do they come with a charger? Yes, a charging station is included with all electric toothbrushes. The charger is 2 pin, how can I use it? The charger is a 2 pin/prong charger designed to be used on voltages of 220-240 volts. It is a 2 pin charger suitable for connecting to shaver sockets found in many bathrooms in the UK & Europe. If you do not have a shaver socket, you can purchase an adapter that will allow the charger to be connected to a standard 3 pin UK mains socket. Can the charger be fixed to a wall? The charging station has not been designed to be fixed to a wall. Can I use the Pro series toothbrush in the shower? Yes. The Pro series is waterproof so if you choose you can use it in the shower. We hope this has cleared things up a little and perhaps removed some confusion. You may well have more questions that need answering. If you do, feel free to leave a comment below and we will answer them for you. What toothbrush did you buy to have this experience? I’m going for a high end model, Genius or smart series, or maybe a pro. I wish I could have a table like the one you have on this page, but with more models and more specs. Oral B UK says some models (Oral-B Pro 2 2500N) have a simple timer of 2 minutes, other have the “pro timer”: 2 minutes divided by 4 quadrants of 30s. Battery like vastly differ between models too! and other features like Sonic mode, brushing mode, brushing mode etc also varies but are not well documented. Choosing a toothbrush is not all that easy, hence our site, to try and help. When you start delving into more of the technical details, it can get confusing. Generally speaking, just using any electric toothbrush is going to be better than a manual or not brushing at all. Going for the most expensive brush or the most powerful is not always the answer, particularly if you are not brushing correctly or regularly. Thanks for the link to your document. You only give viewing permissions, so I am not able to add information in, but to be honest, whilst I am happy to help, this would only b duplicating a little of what I have already created. This best electric toothbrush page, is a good place to start, but I think you want more detail. Therefore take a look at this comparison chart. It outlines the main features of the different brushes. Be aware I have not included oscillations and pulsations, because for most this is not required information. My cleaning modes explained article goes into the extra detail about speed of the brush etc. Pay particular attention to the ‘Power Delivery’ section. Whilst Pro-Clean cleaning modes does make use of the full power of the brush handle, it depends on the brush handle being used as to how much power is actually available. Thank you so much for this 🙂 I have been looking long and hard for something like this. And Oral-B website is not very helpsome. What is the difference between an oscillation and a pulsation on the Oral-B toothbrush? Oscillation and pulsations are 2 forms of movement in the brush head. The oscillating-rotating movement is referred to as ‘2D’ cleaning by the brand. This is were the brush head moves side to side, moving the bristles, cleaning the teeth. Add in Pulsations (essentially vibrations) and this now becomes ‘3D’ cleaning. Pulsations offer a more sophisticated motion and gives another dimension to the brushing. Whereas the 2D cleaning requires the physical movement of the brush head against the teeth, pulsations are essentially a ‘non contact’ form of brushing. It is a non contact brushing as the high frequency pulsations generated by the brush agitate fluids that surround the teeth and and can loosen and remove dental plaque in locations that are beyond the physical touch of the toothbrush. Yes, there is a slight different in power output. Vitality – 7,800 oscillations – The most basic Oral-B power toothbrush. Essentially a bridge from a manual to a power brush, so this may be a good choice for people new to electric toothbrushes. Pro 600 – 8,800 oscillations and 20,0000 pulsations – This is the bridge between using a gentle power toothbrush to the standard power brushes. Genius 8000/9000 – 10,5000 oscillations and 48,000 pulsations – The most powerful and capable brushes in the Oral-B range. What do the numbers mean…1000, 3000, 6000? Debbie, these numbers are model numbers. As the model numbers increase as do the features and prices. Oral-B Coloured Rings – what are they for?